Zombies will win in the apocalypse. Math proves it. Or put another way, for each cycle of contact between people, the message generation (passalong) must exceed the absorption (people who don’t give a damn and stop passing it along). This is how some memes — cultural units of society such as the current fad among youth to wear baseball caps with straight brims instead of curved — move through society. It’s how you get sick with the flu and how computer viruses spread. Unfortunately, viral passalong also works incredibly well for zombies. Zombies, a.k.a. the living undead, have been a concept for nearly 4,000 years, dating back to the ancient poem the Epic of Gilgamesh in the 18th century BC. That story was about battles with monsters, quests for immortality, and the goddess Ishtar breaking down the gates of the Netherworld to “let the dead go up to eat the living.” (That’s right, there are no new ideas coming out of Hollywood.) Mary Shelley rebooted the idea with her novel Frankenstein and we’ve been afraid of zombies ever since. But the basic construct is most interesting today, with our planet swarming with nearly 7 billion people and fears of potential pandemic flu rising: In most modern tales, zombies begin with a lethal outbreak of a virus that rapidly spreads through the population, leaving small bands of uninfected human survivors trying to, well, survive. Which brings us to 2009 and the brilliant academic research paper produced, half in jest, by the University of Ottawa. The theme may be silly, but the math is real. The authors predicted that in any timescale, a population of uninfected people if paired with a population of infected zombies would eventually be wiped out. 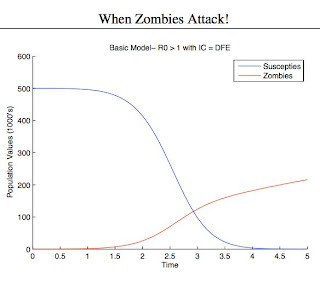 Or as the paper cheerfully stated, “coexistence between humans and zombies/infected is … not possible.” The math is complex, but basically if there are two populations and in any encounter the bad can infect the good with any contact — a 100% zombie virus “message” passalong rate — statistically the outbreak will continue to spread. You will die. 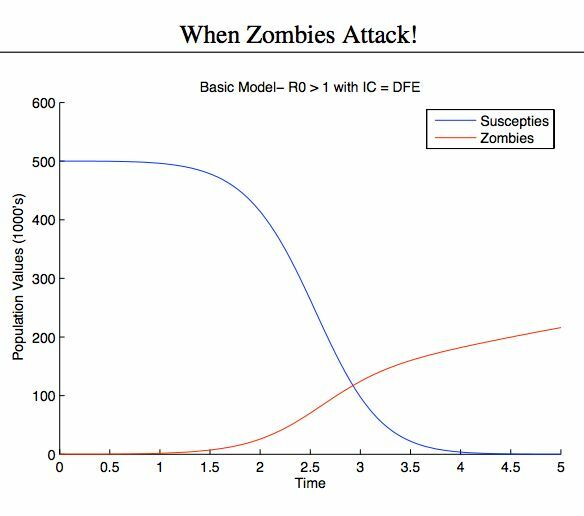 The only hope would be if humans developed an antidote, which could raise the absorption rate (the portion of humans touched who don’t pass zombification along), which in turn would not allow humans to overtake the zombies but a small population of normal people could survive. Zombies are a cultural meme that cannot be stopped. Zombies are the ultimate viral meme that wins, because in any contact, nothing slows it. This also explains stupid straight-brimmed baseball caps. A funny, light hearted post. Thanks, I enjoyed it.